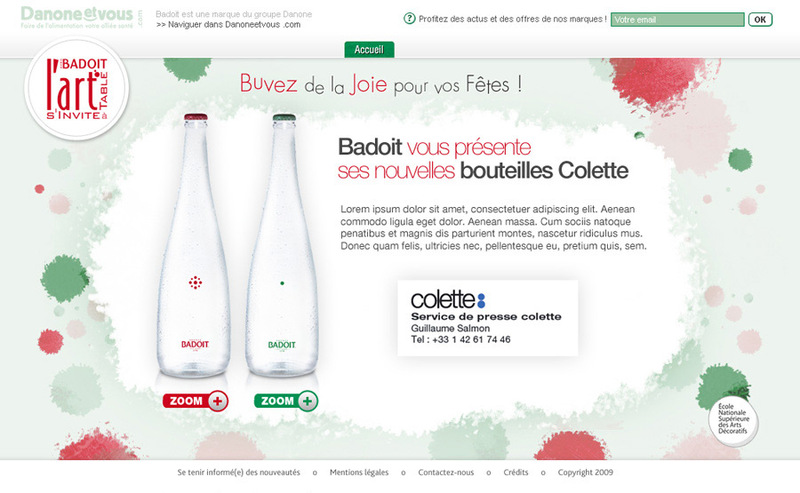 The website “L’art s’invite à table” resulting from partnership between ENSAD (Ecole Nationale Supérieur des Arts Décoratifs), the brand Badoit (a french soda water), and Colette stores. One a year, Colette and Badoit launch a contest with prestigious French schools to design collector bottles. In 2011, it was with the design department of ENSAD. Winers are introduced on the Colette stores in Paris. Users : Students, Investors & Fans of soda water. Three positions worked on this project : Associate Director (Sales Departement), Art Director and Front-End Web Developer. I was responsible for the global design (co-working with Associate Director), Graphics definition, User Interface design and declinations. This entry was posted in Digital Art Direction and tagged Badoit, Colette, Danone, ENSAD, François Soulignac, Web, Web Digital Art Direction by François Soulignac. Bookmark the permalink.